New Year's Eve is just 2 days away. There's barely enough time to shop Amazon Prime, so you've got to do something different. How about checking out your local dollar store? 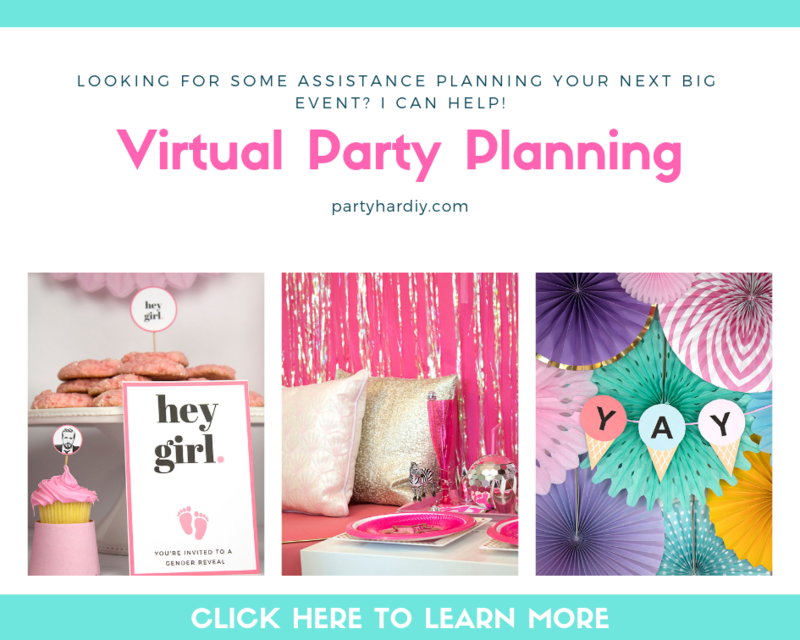 They've got everything you need to throw a really cool party on a budget. Don't believe me? Check out the loot I got from my local dollar store! Note: not everything in this post cost me $1, but they were all under $3 at the local dollar store. I've also linked some items on Amazon in case you can't find them at your dollar store. This post contains affiliate links. Sometimes when you're browsing the dollar store, you'll find some cool items that can be repurposed. At the dollar store, I found these metallic shreds that go in gift baskets, but I thought of a much prettier use for them- confetti balloons! 1. Take your clear balloons and give them a stretch, especially the neck. 2. Grab a few strands of the metallic shreds and roll them up. Squish them into the opening of the balloon, using the drink stirrer to carefully push them through the neck and into the balloon area. 3. Repeat this a few times until you fill up the balloon. Remember that once it's blown up, the shreds will take up a lot less space. 4. 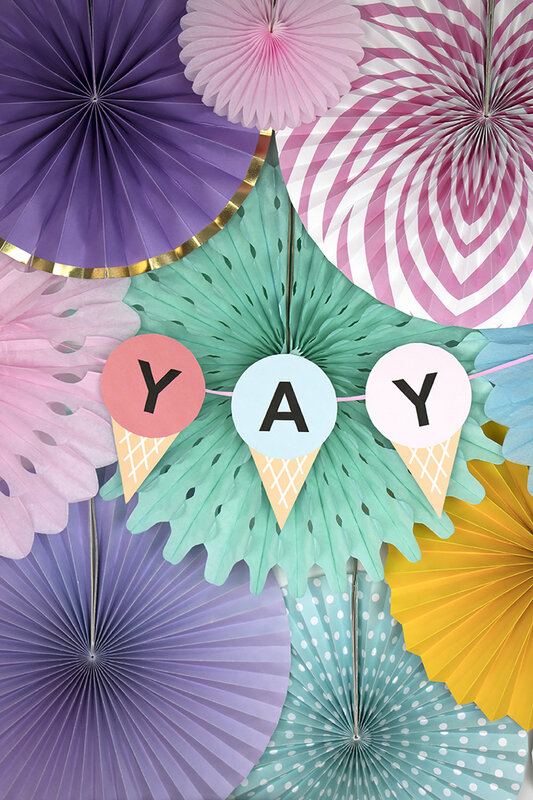 Optional Confetti: Take a funnel or rolled up piece of paper and place it in the neck of the balloon. 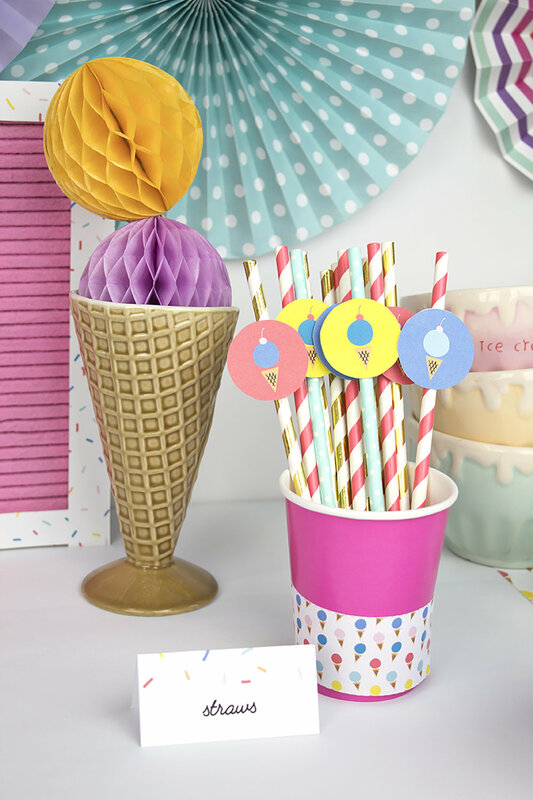 Cut up the shreds to create a confetti and use the drink stirrer to push them into the balloon. I used a paper funnel, so I pushed the confetti down, then used the neck of the balloon to pull the confetti into it. This was easier than trying to shove it all through the tiny hole. 5. Blow up your balloon using the helium or a balloon pump. Remember that air will escape, so it's best to blow these up on New Year's Eve, but you can pre-fill them so they're ready to go :) Then you can pop them at midnight for a fun confetti explosion! 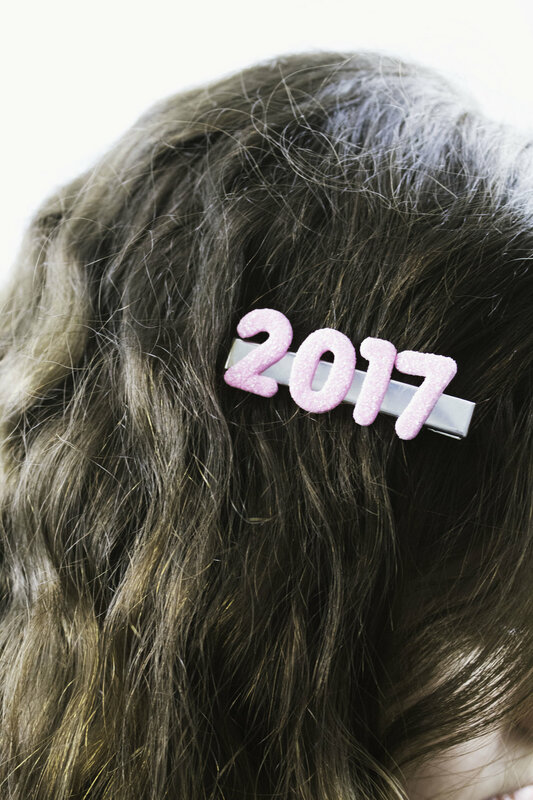 This is probably THE EASIEST New Year's Eve hair accessory tutorial you'll find. All you'll need are some alligator clips and self-stick foam numbers! To make these clips, peel the backing off the numbers and stick them onto the hair clip. Didn't I tell you it was easy?! If you want to jazz them up a little more, you can put a piece of ribbon on the alligator clip so it isn't silver, but I don't think it's necessary and I like the extra shine of the metallic silver. 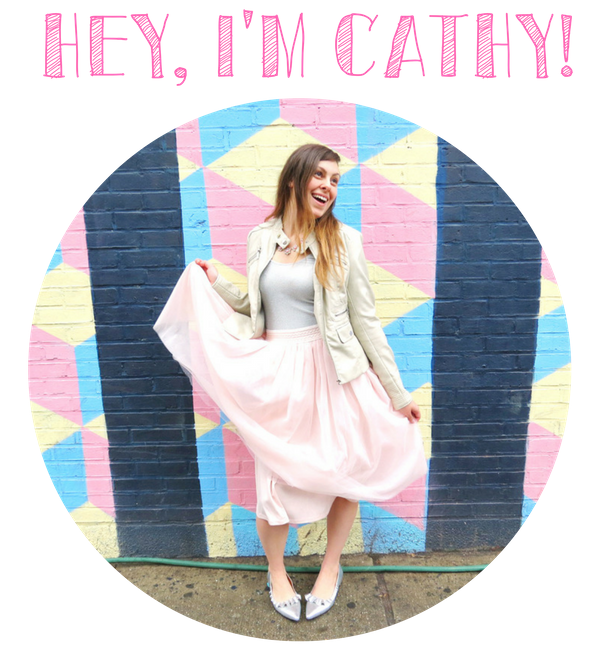 We are going to step away from the DIY projects to focus on the stuff that you can purchase from the dollar store. This stuff is MUCH cheaper than what you can find at Party City or similar stores. I think these hats were $1.29 but at Party City, similar ones were $3+. My local dollar store also had a lot of really cool 2017 glasses. I thought these two styles were the nicest and made it obvious that it was 2017 (not 2007) so I picked 'em. Also those rhinestone ones had the nicest pink color plus they're so Y2K that I couldn't resist. They also kinda remind me of the Times Square ball drop. I got 2 different types of noisemakers. 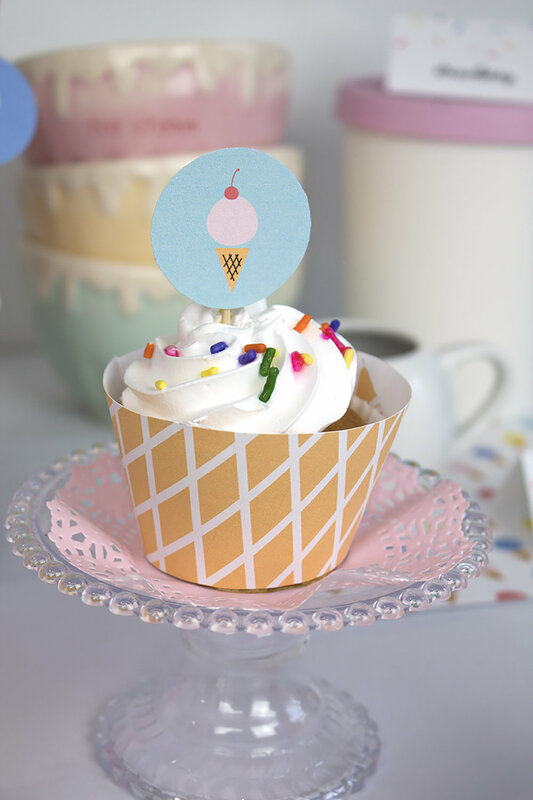 These small streamer ones in pink and blue (above) and the traditional cone shaped ones (below). The cone ones were cheaper and came with twice as many for just a little more than the small ones. Plus they're appropriately themed! I also got some nice trays, cups, plates, etc. for the table, plus all the silver and multi-colored disco balls. They're cheaper than the ones on Amazon and a decent size, so that was a win! I've been wanting to do a fun color scheme for New Year's Eve for a few years now, so I'm really excited that I get to try it this year. 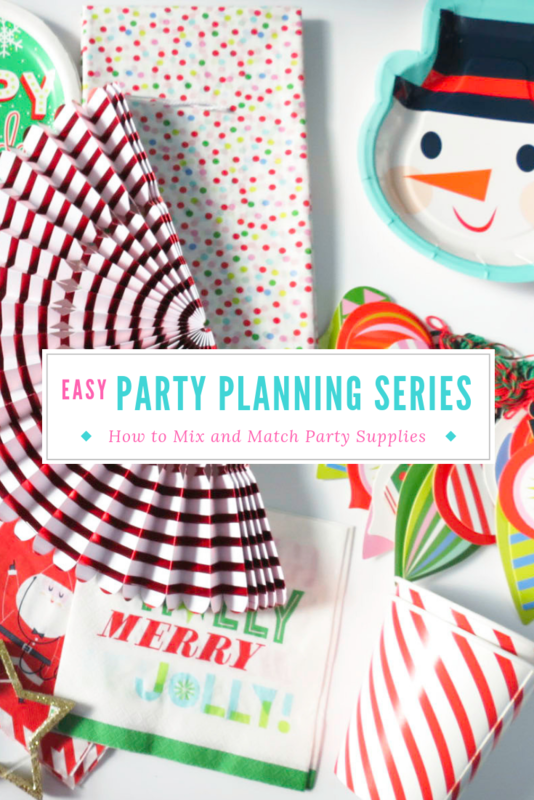 This Christmas I decided to challenge myself by creating a completely unique party scheme using easy to find, store bought supplies- and you can too! I went to my local Target and picked up nearly everything in their Christmas party supplies aisle. I also added in some other items I loved, like this star banner I got from Old Navy and some napkinsI got from Marshall's (similar). I also added in some cups and stirrers I made. First let's take a look at all my supplies while they hang out in their clique. Santa round plates. Santa shaped plates. Santa letter place cards. Santa paper fan. Striped cups. Santa beverage napkins. Striped napkins. Jolly ornament. Merry Christmas stirrer from Target. Red Pom Pom stirrer and clear cups made by me. Snowflake napkins. Snowman plate. Snowflake cups. Merry Christmas stirrer from Target. Pom Pom stirrer, bell stirrer, and clear cups made by me. star banner. 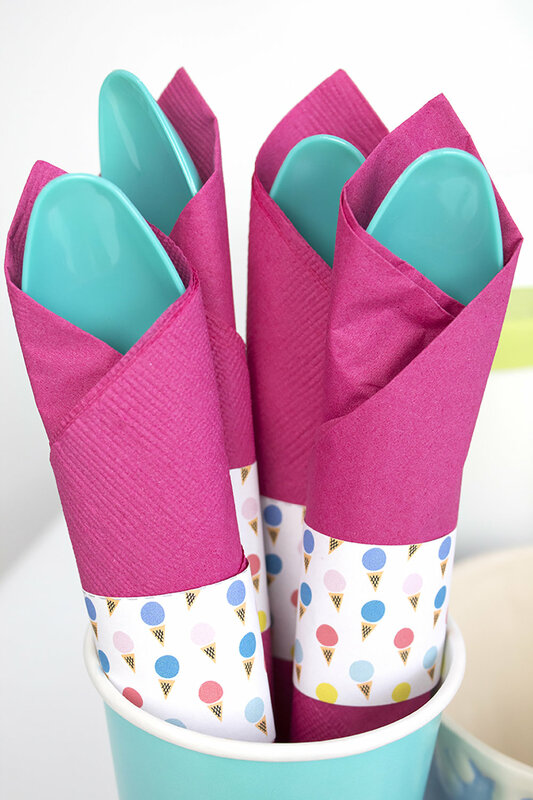 Jolly napkins (similar). Merry Christmas stirrer from Target. Pom Pom stirrer, bell stirrer, and clear cups made by me. Paper fan. Polka dot tablecloth. Paper ornament garland. Happy Holidays plate. Colorful writing plate. Colorful writing napkin. Holly jolly napkin. Pom Pom stirrers, bell stirrers, and clear cups made by me. Aren't they a little boring? Nothing stands out and they feel a little cookie cutter, especially the Santa and the snowman. Simply by trying different combinations of store items, you can create a one-of-a-kind look. So, what's the secret to successfully mixing and matching supplies? In an ideal world, you'd just grab all the things you like the most, and they'd come together in perfect harmony. This, however, is the real world. Sometimes you grab your favorite items and they don't mesh together... at all. Take a look at the supplies offered and think about what you like and why. Is it the design? The color? How functional it is? Think about how all these items will fit together and see which ones work best. Pick the piece you like the most or the one that is the most complex first. Then, see that works best with that piece. Since this piece will be most important and/or hardest to match, you want to make sure the other items fit in perfectly with it. Mix patterns, neutrals and solid colors. To avoid pattern overload, balance out complex patterned pieces with solid colors or simple patterns like stripes. These simpler pieces will enhance the look of your party by complimenting your more patterned pieces instead of competing with them. People's eyes will want a place to rest! Having too many things to look at will overwhelm your guests. This is a little harder to do, but super important. You have to look at how each item looks as a whole, not as individual pieces. What does that mean? Well maybe you don't like that bowl pattern as much as another one at the store, but it fits in better with your whole look. It's important to recognize that not every piece has to be your absolute favorite one, but it'll have to fit in well to give you the overall look you desire. Don't confine yourself to one store. 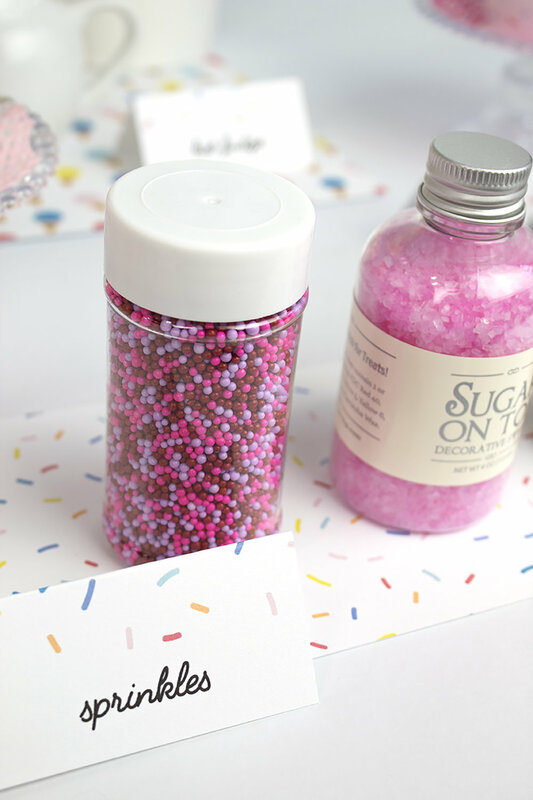 To get a really interesting and unique look, browse several different stores or brands to create a one of a kind party pack. This not only gives you more options, but also allows you to find pieces you really love, instead of only finding the best that one store has to offer. 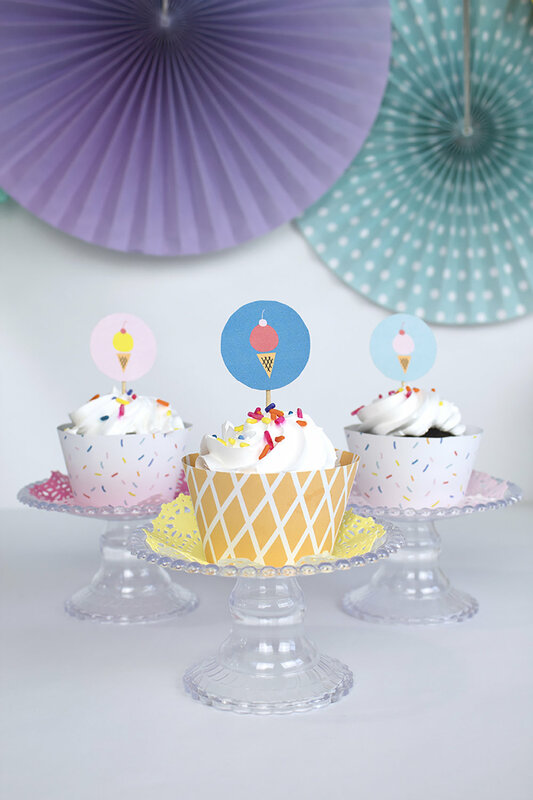 To see my top shops for party supplies, check out this blog post. Do you like the way 2 patterns look together, even though they're technically "clashing"? Go for it! 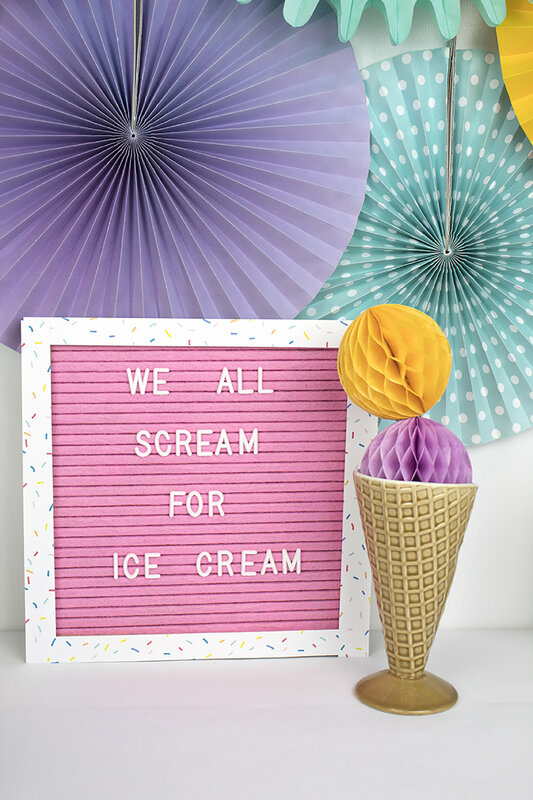 Rules are made to be broken when it comes to decorating and sometimes it's fun to try something new and different, even if it's not the trendy or traditional way to do it. Who knows, maybe you'll create your own trend! Check out what you have. think the best part of mixing and matching is being able to use what you already have. Before going shopping, take a look at your inventory and see if you can enhance what you already have by mixing in some new pieces. By doing this, you can save time and money on purchasing new items. Try to find some consistency or pattern in your choices. The key to being able to successfully mix and match comes from being consistent in some way. This will prevent it from looking like you grabbed any party supplies you could find. What are some factors of consistency that will help you? 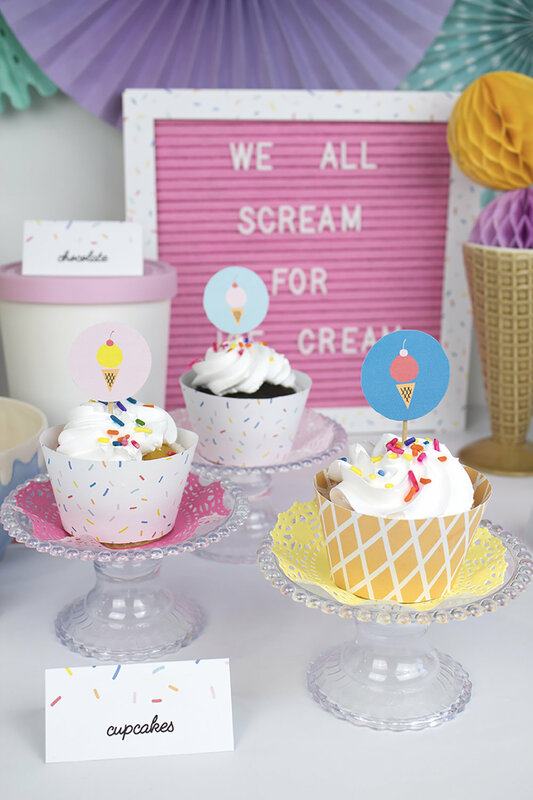 One way to keep a party consistent despite different patterns is by choosing a color scheme. Maybe the thing bringing all your items together is that they all have the same 3 colors in them. Or they're all pastels, metallics, etc. Color scheme is probably the #1 way to create a cohesive look. It's also the easiest, so use that to your advantage! The shape of an item is a great way to create visual interest, but it's also a catalyst to unintentionally creating a mismatch. If all your items are rounded, a square plate may look out of place. If all your items are somewhat upscale, using a cheap paper plate will look totally out of place. 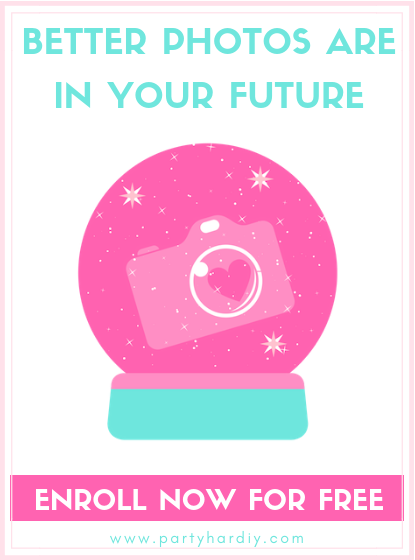 Think about the type of event and what you want the overall look to be, and go from there! Know where to splurge and where to save. For example, expensive straws aren't the best use of money because they'll be tossed away, and a cheaper straw will do the trick. However, it's better to spend a little more on decent plates and utensils. You don't want anyone to have trouble cutting their food or be left with a soggy, drooping plate when it's full of food. To save money, mix in some cheaper items from the dollar store to match your more expensive designed pieces. Learn more about how to save money (and time!) on party supplies by clicking here. When you've got all your items together, take a look to make sure nothing sticks out like a sore thumb. If it does, you've either got to find something to bring it together or just nix it completely. So what do you guys think? 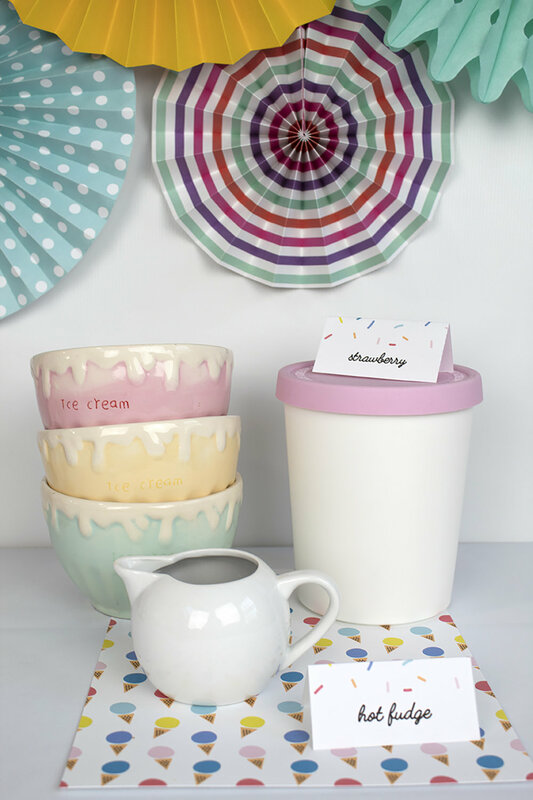 Are you ready to try your own mix and match party? 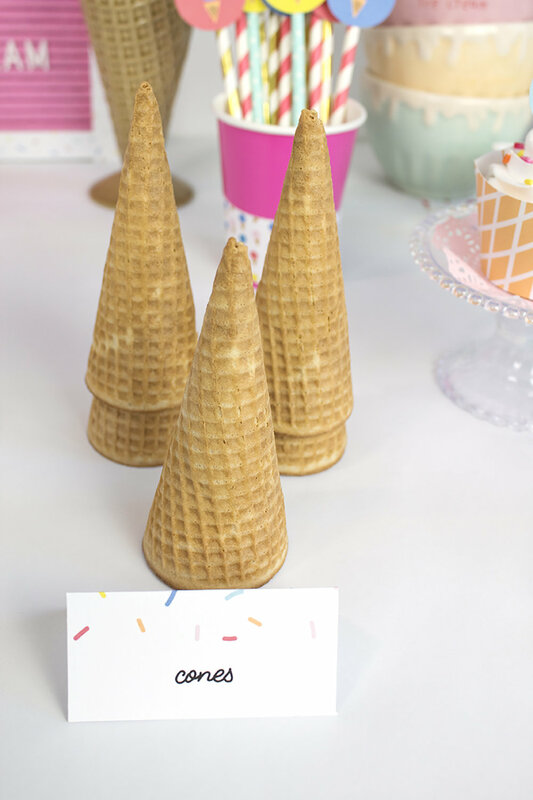 For more party ideas, be sure to check out my Pinterest!